Heels on Wheels Roadshow is a flashy femme caravan from Brooklyn touring the South with a queer performance-art cabaret. Starring dazzling troublemakers Heather Ács, Damien Luxe, Princess Tiny & the Meats, and Sequinette, the show features a multi-media format of high femme drag, electro music, and piercing, poetic theatre. Expect to see Dolly Parton transformations, stilettos flying, eggs breaking and moods changing. 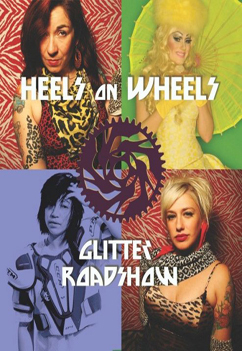 Heels on Wheels delivers a trashy-fancy night of radical extravagance and thought-provoking glamour. We’re getting in our dreamy van for this epic NYC-to-Austin trip March 26 – April 6, 2010. Sunday 3/21 – Brooklyn NY – 8pm @ Collect Pond, 45 Berry St., 8pm, $5. Friday 3/26 – Baltimore MD – 8p and 10p @ Black Cherry Puppet Theatre, 1115 Hollins Street, 21223, $5-10. Saturday 3/27 – Richmond VA – doors 7/ show 8p @ The Lamplighter Cafe 116 S. Addison St. Free! Sunday 3/28 – Durham NC @ 8pm with Humble Tripe Monkey Bottom Gallery, 609 trent drive durham, $5. Monday 3/29 – Asheville NC @ 9pm Club Hairspray, 38 N. French Broad Ave., $5. 3/30-31 – Atlanta GA – Bellissima, 560 Amsterdam Ave, 30306. 9p $5-8. Thursday 4/1 – New Orleans LA – 10pm @ All Ways, 2240 St. Claude Ave., $5. April 4 – Austin, TX @ Gay by Gay Gay Stage, East Austin. April 6 – Waco, TX with Equality Rides!